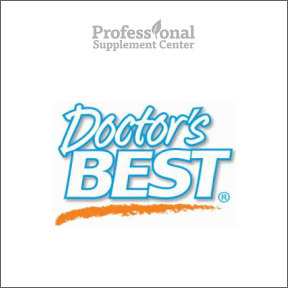 Professional Supplement Center is pleased to announce the addition of Doctor’s Best, a unique line of science-based nutritional dietary supplements. Utilizing only thoroughly researched and rigorously tested superior-quality raw materials, Doctor’s Best collaborates with nutritional scientists and studies clinical trials to determine the most effective ways to provide products that deliver meaningful outcomes. In order to provide consistent results, Doctor’s Best strives to use trademarked, branded ingredients. Quality, integrity and efficacy is assured with rigorous testing of raw materials through finished products. All supplements are produced in cGMP certified manufacturing facilities and every product is monitored throughout the production cycle to ensure the highest quality standards are met. Doctor’s Best was founded by physicians in 1990 and offers over 200 products. Best Ubiquinol with Kaneka QH® 200 mg – This highly stable, reduced form of CoQ10 provides metabolically active antioxidant support that is easily utilized by the body. Bioavailable ubiquinol aids mitochondrial support for enhanced energy production and provides support for healthy heart function and cardiovascular maintenance. No artificial colors, additives or preservatives. Contains soy. 50 mg softgel formula also available. Best Brain Magnesium – This supplement features the proprietary Magtein™ magnesium-L-threonate (MgT), a highly absorbable, well tolerated form of magnesium. This specific from of magnesium has been shown to effectively raise magnesium levels in the brain, supporting memory and learning. Essential for over 300 metabolic processes, magnesium helps to maintain cardiovascular health, normal muscle and nerve function, strong bones, energy metabolism and a healthy immune system. Gluten free, Non-GMO formula. Best D-Ribose Powder – This product features BioEnergy™ Ribose, a simple carbohydrate that is a crucial component of DNA, RNA and ATP, the body’s primary energy source. D-Ribose is a 5-carbon sugar that is efficiently absorbed and supports energy production in the heart and skeletal muscle tissue. Gluten free, Non-GMO vegan formula. Best L-Tryptophan featuring TryptoPure™ – This highly pure L-tryptophan ensures a complete spectrum of positive benefits for sleep, mood and behavior. L-tryptophan supports serotonin production and can safely and effectively enhance sleep without impairing normal waking or interfering with the next day’s alertness. Gluten free, Non-GMO formula. Synergistic Glucosamine/MSM Formula – This formula contains pure sodium-free, potassium- stabilized glucosamine along with OptiMSM®, a 99.9% pure distilled sulfur. This supplement helps to maintain healthy joint cartilage and connective tissues. Vitamin C is added for its ability to strengthen and support production of cartilage. This entry was posted in Home and tagged Best Brain Magnesium, Best D-Ribose Powder, Best L-Tryptophan featuring TryptoPure, Best Ubiquinol with Kaneka QH® 200 mg, Doctor's Best, Synergistic Glucosamine/MSM Formula. Bookmark the permalink.